Another thing to feel guilty about. Via Treehugger: Say! Did you know that laundering your synthetic clothing may be contributing to ocean pollution? Apparently studies have found that washing releases up to 1900 microfibres from each piece of synthetic clothing per wash. These bits of plastic are too small to be removed by conventional filtres and water treatment, so the plastic washes out to sea, where it (along with microbeads) contributes to a serious ocean pollution problem. This strikes me as one of those rare pieces of environmental news that has direct relevance to home sewers. While I prefer natural fibres myself, sometimes they’re just not available locally at a price that is reasonable. And sometimes they’re plain not available locally. I searched high and low for stretch cotton twill for my recent Jasmine pants, but in the end the only stretch twill I could find had a substantial poly content. I’m in general opposed to lifestyle-scale solutions for global-scale problems, so I’m not going to tell you what kind of fabric you should buy. As the article itself notes, given how much sheddable synthetic clothing is already in circulation, that likely wouldn’t address the problem anyway, and what we really need are better filtration systems (though this raises the question of what to do with all those bits of plastic that would be flushed out of our domestic sewage systems). Still, as home sewers, we have managed to create (or at least increase) a reasonable supply or organic and local fabrics; maybe, if there were enough demand, less easily shed synthetics would be created and sold. In the meantime, this may be another good argument for laundering clothing less frequently. In addition to the waste of water and electricity and the pollution of water from soaps and detergents, we’re plasticizing the oceans. Fantastic. So how about we only wash our clothes when they’re dirty? I may have mentioned that 2013 was a steamroller of a year, and that Hibernation 2014 was basically me burying my head in the sands of sewing until I felt like I could look at the world again. After about nine months of denial, I thought I might be ready to test the waters of environmental catastrophe again–and I was right! Have no fear. We are still mostly sewing here. But also, I read a book about one of the Ends of the World, and I survived, and I think I can even write about it. So I will. As with all of Elizabeth Kolbert’s writing, it is beautifully written, compelling, meticulously researched, well structured, and absolutely terrifying. The Sixth Extinction (which is happening now–you can be forgiven for not knowing that, since it is so abysmally reported on) is the tale of the many and varied ways humans are causing this latest mass extinction event. They’re all here: prehistorical and modern-day overhunting; transmission of invasive species; habitat fragmentation; climate change; ocean acidification. In keeping with the evidence, though very much against the preferences of human psychology, the book ends on a despairing note. While humans do expend a great deal of energy in identifying and saving particular endangered species when they are particularly beautiful or otherwise beloved, that is in no way up to the scale of what’s required, and it is very difficult to see how this could be turned around. I wish everyone would read this, or at least become more informed about it; not because there’s anything we can do by becoming more informed (there almost certainly isn’t: many, and likely most, species will simply cease to exist). But because an event of this significance and caused by us deserves to be marked and mourned while it is happening. A biotic Holocaust is underway all around us, every day, species and families of species being shoved into gas ovens as fast as we can manage it; and outside, we celebrate sporting victories and royal babies and new gizmos to buy. I can think of no more severe condemnation of human nature. That’s a toad, eh? Look at those itty bitty fingers! 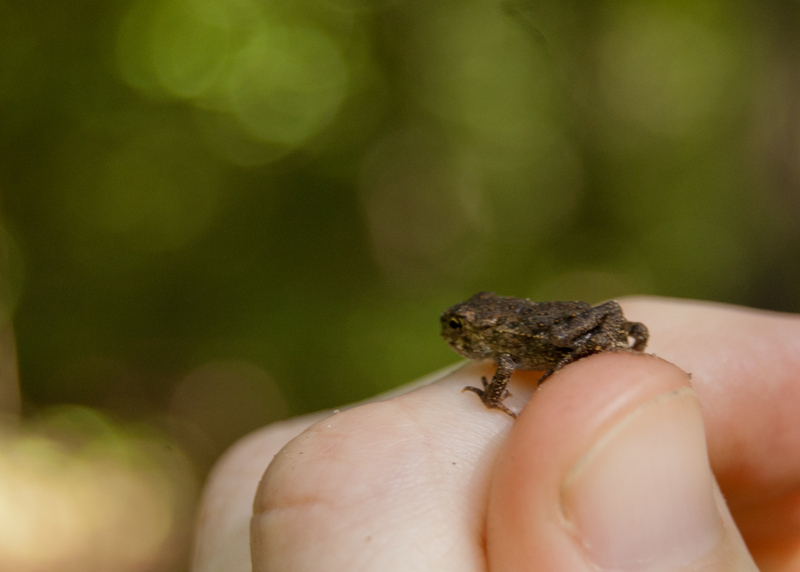 Frances and I like to catch baby toads in the spring. They are itty-bitty, and they hatch en masse, so if you go to the right place at the right time of year, you will find dozens or hundreds of housefly-sized frogs springing all over the place like rubbery crickets. They’re adorable, and fairly easy to catch, and most children are entranced at the sight of these tiny little froggy things. You can have one perched on a fingernail. According to The Sixth Extinction, this may not last. 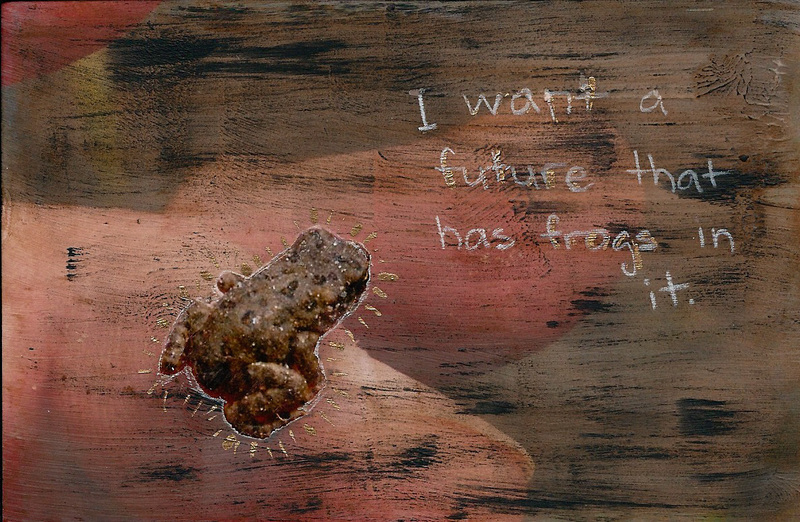 Amphibians are the most endangered class of animals globally, right now, due to chytrid fungus, spread from the use of the African Clawed Frog as an early pregnancy test, as well as habitat loss and fragmentation, water quality issues, climate change, etc. Over thirty per cent of amphibian species are at risk of extinction today, and the extinction rate for amphibians right now is 211 times the background rate as a conservative estimate. These are animals that have survived every mass extinction event since before the dinosaurs, but they may not survive us. When I’m not sewing, or embroidering, or reading (or working or cleaning the house or making dinner or whatever), sometimes I do papercrafting. Not scrapbooking, per se, but it could be altered books or altered photos or painting or calligraphy or some kind of multimedia project. When I was feeling particularly down about environmental issues last year (occupational hazard when you work in the environmental field), I made this. At the time I thought I was exaggerating. And now maybe we need even more happy sewing talk than before. “Canada’s economy is integrated with the United States’ to the point where it makes absolutely no sense to proceed without aligning a range of principles, policies, regulations and standards. This has been quite a day. None of these were enough, at least not for anyone I know. Too many states still do not allow gay marriage, so overturning DOMA is a partial (albeit significant) victory at best. One piece of anti-choice legislation was overturned, but only one, with far too many waiting in the wings and not enough Wendy Davises to go around. And President Obama’s proposed actions to reduce GHG emissions, while long overdue and certainly meaningful, are nowhere near sufficient. Still, it was a day with a lot to celebrate for a lot of people, and it’s important to grab those partial victories where you can and wring every bit of good you can get out of them. I’ve often wondered if opponents of climate change action have a back-up planet they’re planning to emigrate to when this one is no longer habitable. Unfortunately, if they do, it’s not a plan I’m privy to and I’m not expecting they’ll save Frances a seat on the shuttle, so I’m going to keep trying to save this one. *Geeky analysis section: Part of any environmental assessment of any size is determing the scope of the project to be assessed. In my former jobs, it wasn’t unusual for an environmental assessment to focus on, say, just a bridge over a river (when the bridge was being built as part of a road to support a new mine or forestry project) or a sign (when the sign was a small part of an overall new building project) or fence (when the fence was part of a runway expansion). If the bridge, sign or fence is all that you are legally required to evaluate, then the scope of the assessment does not include the mine, logging operation, new building or runway expansion; which means that the environmental impacts are negligible and the project is all but certain to be approved. Obama’s comments in the speech yesterday on Keystone and the tar sands left this question wide open on the proposed pipeline: whether the pipeline “contributes significantly to carbon pollution” will of course depend on whether the tar sands are ruled in or out of scope for the assessment. If the tar sands are out of scope for the pipeline, then the assessment will for all intents and purposes be identical to a sewer or water pipe, and the project will be approved. So, key for the Harper government’s efforts in getting the pipeline approved will be to continue their “the tar sands will be developed whether this pipeline is built or not” message. It’s boloney, of course; if you don’t have a logging road then you don’t have a forestry operation, and if you don’t have a pipeline then you don’t have an oil operation. The other certainty is a continued push on all the not-nothing they want us to believe they are already doing. Just remember, whenever you see those fancy stats the Tories like to pull out of a hat about their climate initiatives: a) most of the reduction numbers they quote are what we might achieve if all policies are implemented in full–i.e., we’re not there yet and there’s no guarantee we ever will be, and b) to the extent those numbers reflect actual current emissions, almost all of them are due to municipal and provincial GHG reduction initiatives that the federal government either did not assist with or actively tried to derail. Ontario’s Environmental Commissioner released the annual update report on provincial progress on greenhouse gas emissions. The good news is, we are not failing as badly as we were. Our greenhouse gas emissions are falling provincially, largely due to decommissioning coal electricity plants. The bad news is, we are still failing. We are still above our 2014 target of 166 Mt, and considerably above the 2020 target of 150 Mt, with no clear plan in place for how we intend to bridge that gap. In fact, the ECO is predicting that GHG emissions will rise as the nuclear plants are refurbished and the electricity demand gap is met by natural gas. As well, while we have done an excellent, back-patting-worthy job of reducing emissions over the past approximately 10 years, forecasts past 2020 predict a rise in GHG emissions to 190 Mt by 2030. You can practically hear the poor guy banging his head on his desk in frustration in the report. Road transportation, and particularly private vehicles, are the largest source of emissions in the province (58 & 45 Mt respectively). In order to meet GHG targets, we must fund public transit, including the Big Move proposed by Metrolinx. I’ll add this, though it shouldn’t need to be said: Nothing is free, and we’ll either pay for this now through increased transit funding or later through climate change adaptation costs, and any half-qualified economist will tell you that the future costs of dealing with climate change make that $470/household/year Big Move projection (already offset by congestion savings of $1600/household/year) look like a fruit fly on an elephant. Just get over it, and pay up. Industry emits 49.6 Mt. Ontario has been putting out policy papers on establishing an Ontario cap-and-trade system to bring that number down and put a price on carbon for four years now. It is time to move beyond policy papers, and actually put something into action. 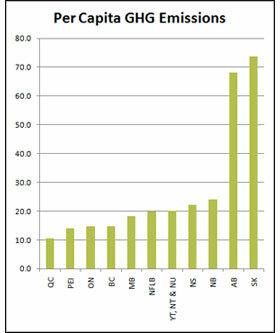 Ontario produces fewer Mt/person than most Canadian provinces–which is good, but in a global context still makes this one of the most wasteful places to live. And our emissions are on the right track. We are one of the few provinces who have had declining emissions, which is great. But boy, are we ever still producing a lot of greenhouse gases. We are one of the few provinces who have had declining emissions, which is great. But boy, are we ever still producing a lot of greenhouse gases. The atmosphere refuses to be pragmatic. It’s a geological and chemical process that will react to inputs, regardless of how desirable the outcomes are or how politically feasible the solutions may be. It will not negotiate with us. Or in other words, while we are improving, and that’s good, we are still failing by a wide margin. We can and we should do better. I am sitting here this afternoon with a copy of the National Energy Board’s Application Form to Participate, for the upcoming Enbridge pipeline reversal to carry tar sands oil through Ontario, and specifically through my community. The Government of Canada, in order to streamline environmental approvals for tar sands projects, now requires people to fill in an application to participate in the public consultation process. No more can you show up and just start talking to people because you’re a citizen in a democracy and you care about what happens. As of now, if you can’t demonstrate in writing a direct impact on your own personal life and/or special expertise in the subject under question, your participation is neither wanted nor required and will not be allowed. If I (or you or anyone else) want a chance to participate, we must complete and submit this application form to Enbridge–yes, that’s the proponent–by April 19th. Wow. You know, if a proponent under the Ontario process were to try pulling something like this, their project would never be approved. A citizen must demonstrate to a corporate entity that they should have the democratic right to participate in an environmental assessment process? Yes, that is correct. If you want to claim special expertise relevant to the public consultation process, you must submit supporting documentation, including a resume. The entire project is about the tar sands; the pipeline in question currently carries natural gas from east to west, and is going to be reversed to carry tar sands dilbit from west to east. How can you talk about whether or not this project is acceptable without talking about the tar sands? That’s like having an environmental assessment for a highway expansion and ruling out, from the start, any discussion of the environmental impacts of cars or alternatives to private transportation. In the case of the pipeline, by ruling out the tar sands, you’ve limited any discussion of environmental impacts to pipeline spills. Not nothing, to be sure, but also not the important part. Which, if Canadians had any chance to weigh in on tar sands development in any other forum, wouldn’t be so offensive. But we don’t. The Government of Canada is going to develop the tar sands, come hell, high water, oil supply gluts* or, what’s more likely, all three at once. I’m sure the NEB and Enbridge think this is going to save them all kinds of time. By eliminating 99% of the people who would like to participate in the hearings, it sure will be a lot more streamlined–to the point of being a slam-dunk for Enbridge; I’ve never heard of a project being turned down because you might have a hydrocarbon spill–and I’ll bet you they won’t have to deal with anyone showing up for a public meeting and standing in the front row screaming threats at the panel. Just my guess. But say, wouldn’t it be fun if, before they got the slam-dunk streamlined review process, they had to wade through about 5,000 application forms first? *There is so much oil being produced in the tar sands right now that a supply glut is requiring producers to sell their product significantly below market value–$80 instead of $120. So not only is Canada destroying the environment to produce a fossil fuel with enormous social and ecological impacts lasting over a geological time scale, but we’re doing it at a discount because the product is not currently needed. I’m sure an economist can fill me in here on the wisdom of the free market in this regard and how it is effortlessly taking care of our true needs. 2011 is the year for climate activism (knock wood–so far): the Keystone Pipeline protests at the White House, Climate Reality last week, Moving Planet this weekend, a Keystone Pipeline action in Ottawa on Monday, all in September. Chances are you missed the White House bit and won’t be making it down to NYC for Occupy Wall Street, nor will you be busing it up to Ottawa to camp out on Parliament Hill and tell Stephen Harper what an idiot he is. I digress. Chances are, you are not traveling for climate activism. But lucky you, you don’t have to! For the very laziest among you, log on to the Climate Reality project and watch the highlights videos from the comfort of your den or living room. At the very least, watch Doubt & the concluding New York City highlights. That’ll take all of 15 minutes of your time. For the less lazy, Moving Planet is this Saturday, aka tomorrow, and climate change events will be held all over the world. I know of several within a one-hour drive of my house including rallies, bike rides, fairs and clean energy exhibitions. It might be–I fear to even whisper it–fun. I count myself as fairly lazy most of the time (fact: I do not own a hairdryer, mostly because I see no point in burning coal to get my hair to dry faster when it’ll dry on its own anyway, but also, it saves me a heap of time every morning and I’d much rather sleep), but even so, I’m hoping to get out to the Hamilton Moving Planet rally tomorrow afternoon. I wrote this story last winter after having been introduced to Pauline Browes at the Sustainability Forum in February at the Toronto Botanical Gardens. (Which, incidentally, is beautiful in the winter and totally worth a visit.) It ran in Phil Goodwin’s E-Don, a newsletter for the East Don Parkland Partners, a group I volunteer with and have written about before. If you’re interested in Don River issues you can find and friend the group on FaceBook. I do a bit of volunteer writing that will probably find a home here from time to time. Volunteer writing is fun, but I’ve been trying to find this story a home with a wider readership for a while now. Alas, no luck so far. So here it is for you, Dear Readers; and if an editor wants to bite, send me a note! The Rouge Park, Canada’s largest urban wilderness park at over 11,500 acres, with its well-preserved Carolinian forest, native Heritage Sites and agricultural communities, is a historic and environmental treasure within Canada. But because of its many-layered ownership (portions are owned by the Town of Markham, City of Toronto, Ontario and the federal government through Transport Canada) and idiosyncratic management under the Rouge Park Alliance rather than a single government body, it has not always been well-protected or promoted. The Rouge Park Alliance commissioned a consultant study in 2009 to outline and recommend the best option for protecting and promoting this resource; received early in 2010, it recommended that the Rouge be made into Canada’s first and North America’s largest urban wilderness National Park. Andrea McDowell sat down with Hon. Pauline Browes, a member of the Rouge Park Alliance and Director of the Waterfront Regeneration Trust Corporation, to talk about the Park, the report’s recommendations and next steps. Andrea: Let’s start with the history of the Rouge Park and the Rouge Park Alliance. Pauline: It goes back to the early 80s when Save the Rouge Valley System, an organization of volunteers, formed to have the Rouge from Steeles to the Lake saved as a park. I stepped into this at the time, I was an elected member and they asked, what can the federal government do to help? I said, the province owns the land, I’m not sure, but leave it with me, I’m very keen about this being saved as a park. I was parliamentary secretary at the time to the Minister of Environment. The province was not happy about the federal government stepping in because they owned the land so the provincial government said it’s nice that the federal government says this should be saved but what about some money. Well, I got the minister to announce $10m for the Rouge and so that was in the late 80s that we got that. David Crombie in 1995 announced the structure of what we call the Rouge Park Alliance, which is representatives of the municipalities within the watershed as well as the provincial and federal government, representatives from the NGO Save the Rouge Valley System. The present current park goes from Lake Ontario to Steeles, which is the Toronto part, and then from Steeles up to 16th Ave which is part of Markham. When David Crombie set this up in 95, he said this would be an interim basis, and that in 3 or 4 or 5 years the structure would be reviewed to see how it should be. And we’ve had a lot of meetings over the years, but never been able to come up with anything that actually took hold. Just this past year, it was very evident that we needed to have a different governance model, and we needed more financing. And we needed to have a legal entity for this, because right now there’s no legal entity. Toronto does some stuff, Markham does some stuff, the Conservation Authority—I mean, it’s amazing that we’ve been able to accomplish as much as we have. So in the spring we engaged a consultant to review governance, come up with a model, and come up with the financing. And though we have done this in the past over 15 years, what we put forth to the consultant, we needed to have something that we thought would actually be able to work. Our consultant has been in contact with both the provincial and the federal government as well as the municipalities to review the prospective models. They have come up with the model of the national park. A: What is the authority and the mandate of the current Rouge Park Alliance? P: Well, that’s the crux of this problem. The mandate is to protect and preserve the watershed. We’ve had a major study of the Rouge watershed, we have a Rouge management plan for south of Steeles, we have a Rouge North Management Plan, but there is no legal entity for this. And this is why we need to have one level of government to step forward to be the lead on this. This report has said the best model would be the federal government. But we know that it doesn’t fit perfectly into the National Parks Act. So it’s going to be a hybrid of a national park, just like the marine parks. A: The report mentioned that there some competing visions for how the park could look. What are some of the other options? P: The park itself is one that needs to be discussed in terms of what are the uses here, are there some recreational uses that need to come in here …. This is such a treasure because it’s a wilderness area surrounded by 7 million people, and we want to keep it in this natural state. We also want to be able to preserve the agricultural lands. And agricultural lands that particularly are in the federal lands, the expropriated lands from the [Pickering] airport. This is excess expropriated lands that will not be needed for an airport even if it did go ahead. Also, there are some very interesting heritage homes buildings within the area. There are two national historic sites already established in the Rouge. One is an aboriginal burial ground, which is called Bead Hill, and the other is Carrying Place Trail. The aboriginal aspect of the Rouge is significant to celebrate, and so all that needs to be taken into consideration. The other thing that’s really important to do is to have an interpretive centre. Right now, if I have friends come to visit me, and I say you should go and see the Rouge when you’re in the GTA, it’s absolutely magnificent. And they say, well where do I go? Every national park has an interpretive centre, even Bruce’s Mills and Conservation Areas have interpretive centres. So people can go to the interpretive centre, find out about this, where the trails are, look at the pictures, have interactive kind of stuff there, and then go from there. A: What are some of the other main advantages of the national park model? P: The Carolinian forest is one of Canada’s most endangered ecozones, and the Carolinian forest in the Rouge is one of the last and this is of national significance. It’s been stated that there are 15 nationally rare and endangered species in the Rouge. This area would be a tremendous ecotourism destination for the GTA and for Ontario. It would be a huge win all the way around in the public interest. To be in the GTA and in to and take one transit ticket and you’re in a national park—I mean, I don’t know how many people are able to get to a national park so easily. If this can go ahead, this will be the largest wilderness park in an urban area in North America. A: How do you see that process going forward? P: We’ve had this report for 30 days, so in the next 30 days we’re going to be hearing back from our partners, all the municipal folks who are sitting as members of the Rouge Park Alliance, asking them to comment on the report. And we’ve been urging the federal government and the provincial government to begin negotiations. They have said they want to wait until this report is out. So now the report is out, now we’re going to hear back from the partners, and so we would hope that the players, the federal and the provincial government would then sit down and discuss this. 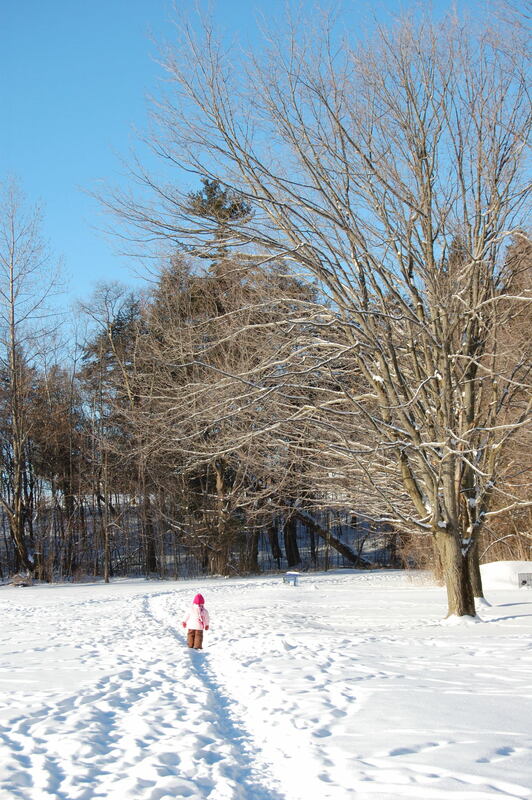 For more information on the Rouge Park, to volunteer or to read the consultant report, visit http://RougePark.com . A companion website to promote the National Park concept has been set up at http://rougenationalpark.ca .